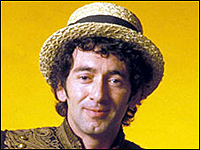 Award winning songwriter, producer and musician Jona Lewie has had an illustrious career in the industry. From his early days playing piano with blues legend Arthur “Big Boy” Crudup, through early chart success in 1972 with his self-penned Zydeco hit “Sea-Side Shuffle”; to his Ivor Novello winning Christmas Perennial hit “Stop The Cavalry”. Indeed, Jona has had major chart success internationally not only with “Cavalry”, but also with tracks such as “Louise”, and “You Will Always Find Me In The Kitchen At Parties”, amongst many others. The majority of his hits will always be associated with his time signed to Stiff Records. A major new BBC documentary series was recently shown about the label that once again brought wider public attention to Jona, his music and the infamy of the label. Coincidentally, his 2nd Top Of The Pop’s performance of “Kitchen” although downed many times, has been one of the most requested clips on YouTube, achieving more than 150,000 hits on one channel alone. It continues to bob up and down on various channels, and continues to score hits. Recently, Jona has been working on the last track of his new CD currently planned for completion in the Spring of 2009. His live show features material from this new album along with his ever-familiar hits. A “best of” compilation of his Stiff Records recordings is available from Union Square Records. I recently had the opportunity to speak with Jona Lewie about his early days, all the bands he's been in, his want for an American your, and his days selling icecream at Wimbledon! 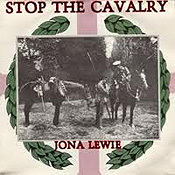 Taking it from the top, and at what point did John Lewis become Jona Lewie ... and why? (Nothing to do with it being the same name as the UK's favourite retailer, is it?!) "My mother would sometimes call me "Jona" as a nickname and friends at school would often call me "Lewie". When I was thinking of developing a solo career I thought I would combine the two nicknames to make my stage name "Jona Lewie" as opposed to "John Lewis" as it seemed to be a bit more snazzy sounding." "I wasn’t conscious of not wanting my name to be the same as the name of the shop in Oxford Street, London. At one point I was thrilled at having the same name as the John Lewis who was in the Modern Jazz Quartet except that I didn’t really play Modern Jazz." "I was doing solo recordings as Jona Lewie by around 1974." It seems that you joined you first group, The Johnston City Jazz Band, while still at school in 1963, before going solo, and then accepting an invitation to join the already popular cult blues band, Brett Marvin and the Thunderbolts. What was it about this band and their offer that made you join them, how long were you with them, and what was one of the highlights of those days? 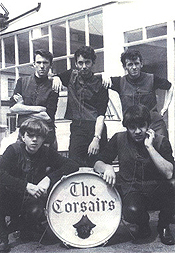 "Actually, before I went solo I was in another band as well called The Corsairs. We were all just kids and it was just an R n’ B band which was all the rage at that time in 1964 but we did get to back U.S singer Gene Vincent when he came over to England that year which was a special moment." "When Graham, the leader of Brett Martin and the Thunderbolts invited me to join the band in 1969, I was still doing solo gigs as John Lewis as a Blues singer but it was a good time in my life to join a band again because I was in my third year at college studying for a Degree and the solo gigs I was doing were becoming demanding because of my studies, whereas playing in a band was almost by definition not demanding on one's nerves at all and actually enjoyable. For example, after not playing in the band for 3 or 4 weeks, and then to do a gig with them, the first 15 minutes or so were fantastic and was like the coming together of solid brethren." "Funnily enough for the first year with the Bretts I was the pianist only, mainly because of my studies, and I didn’t become one of the Lead Vocalists until about a year after I had joined." "Everything seemed to fit the moment perfectly for me at that time and the bonus was that I had a lot of confidence in the band’s prospects for a strong career in music." "I joined in Sept 1969 at the beginning of my final year at college." "On the day I left college in June 1970 the band officially became professional where all the members of the band were agreed on doing more gigs. I left the band approx. early 1973." "One of the highlights of those early days was being the pianist for Arthur “Big Boy” Crudup while he was recording the album “Roebuck Man”. I was asked to do it by Ron Watts and Chris Trimming of the National Blues Federation of Great Britain in 1970. (Ron had already asked me to play blues piano for an album by Juke Boy Bonner the year before and had got me a couple of gigs etc in the past.) 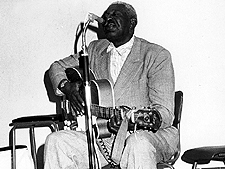 Arthur ‘Big Boy’ Crudup was, however, really special to me because he had written “That’s All Right Mama” and that was the first song Elvis Presley recorded for the Sun label." "I already had known that Crudup had had a big influence on the young Elvis Presley and Presley in turn was one of my big idols, (along with guys like Little Richard Chuck berry and Fats Domino) as a10 year old kid - so I was particularly keen to meet Crudup." "As for his album title “Roebuck Man”, well there’s a story about why the album had that title which I can tell you about on another day." Indeed, it wasn't until you signed to Stiff Records that you scored some major chart time with the humorous synthpop number, 'You'll Always Find Me in the Kitchen at Parties.' Can you tell us more about how this song came to be? "It was one of those good luck stories. Some years after I’d left the Brett Marvin band and had ended up being signed to Stiff Records, a happening big time Independent Record label at the time, Keith Trussell, a member of the Brett band, came to see me a couple of times. At that point I had not seen him or any of the other guys in the band for some years and it was nice to renew acquaintances." "The second time he came round I noticed this time he’d left a lyric book behind and I thought I’d flick through it casually thinking at the back of my mind “just in case” and, as luck would have it, it happened i.e. I did fall upon what I thought was a brilliant line and would make a brilliant title as well." "So I rang him to ask if he would mind if I write a melody around the idea and to add a few lyrics to his firstly to turn it into a story and secondly to give it a happy ending. He agreed to that and blah blah hey presto………….….although maybe it wasn’t quite as simple as that because, when I finally got into my studio to do the demo, (after extensive touring with fellow Stiff label mate artists etc), and, when eventually Stiff Records agreed for me to go ahead and finish it as a master, and, after it was finally released, the tightrope between its becoming a great success and its being a terrible failure was very thin indeed - but that again is another story for another day." "Another lucky twist of fate was that Keith’s band themselves could have picked up on the lyric idea but apparently had not done so at a band practice hence it was available." Rumour has it that Kirsty MacColl was the female vocal in the chorus, but subsequent reports have it as the wives of Bob Andrews and Dave Robinson (the owner of Stiff Records). That said, Kirsty did appear with you a few times on TV to mime/perform the very same vocal chorus! AND, Karen O'Brien's biography, Kirsty MacColl: The One and Only, indeed claimed this as MacColl's first vocal backing recording for Stiff Records! So, now that I've got a right ol' headache brewing here, a) is it her on the recording, and b) why all the 'he said she said' melodrama anyway? I mean, what difference did/does it all make - then and now? "I was at all of the recording sessions and I can confirm that Kirsty did not sing on the chorus and it is true to say that it was the wives of Bob Andrews and Dave Robinson who were singing the chorus. I'm afraid Karen O'Brien's biography is incorrect on this particular point but it is true to say that Kirsty did perform / mime with me on a couple of TV shows." "I'm not sure if it is important to be into such miniscule facts and details for too many people, but it could be important or interesting for some people to know how fact, fiction, misunderstanding and myth and can ride together." And then came your biggest UK hit, 'Stop The Cavalry,' which although fast became a Christmas chart success, wasn't originally intended as a Christmas song! Please explain this more, why it got held back for that time of year, and where it's lyrical origins came from? "The reason ‘Stop the Cavalry’ became associated with Christmas in England was because one of the lyric lines was “wish I was at home for Christmas” which was I think partly why the record company could have made a business decision to release it in time for Christmas, even though it was not necessarily a major concern of theirs." "In terms of the track being “held back” to coincide with the English market, that is not strictly true as the final mix of it occurred in late October and so it wasn’t ready for release until then anyway." "Bob Andrews and I who were the co-producers of this track had already done an earlier mix in conjunction with the engineer at a particular studio but I and the guys at Stiff Records in particular the boss, Dave Robinson, weren’t happy with that mix and he said he wanted us to go and do another mix in a different studio where we used therefore a different sound engineer, etc." "This was in spite of the fact that we were already in October and very close to the Christmas market but it was good to see that Stiff Records were making decisions based more on creativity than on economics. In hindsight, it would probably be true to say that if Bob and I had delivered the track even a week later, it would have been too late for the Christmas market. At the time the main concern was to get it right and, when push came to shove, I‘m not convinced that they would have been adamant about a particular release date." "The first lyric line I had for this number was “Can you end the gallantry?” which led me to think of “Can you stop the cavalry”, and then I was thinking about the Charge Of The Light Brigade in the Crimean War in 1854 where the English army charged gallantly towards the Russians: but also towards their deaths." "The lyric mushroomed from there to include various war time scenarios and predicaments but its main concern was from the point of view of just one soldier who would be cold and hungry on the war front, say for example, in France in the trenches in the Great War of 1914-18, while the men who started the war, the leaders of the countries etc, were eating great food back home and sitting near their warm coal fires." "It’s an instant in time where the solitary soldier daydreams to himself that if there were ever an Office for all the Presidencies of the entire World, he would stand for that office and if he won the election he would make sure that he himself would end the gallantry and STOP all the guys in the cavalry in all future wars from ever charging to their deaths again." OK, now I'm singing, over and over in my head, "Hey, Mr. Churchill comes over here to say we're doing splendidly, But it's very cold out here in the snow, marching to win from the enemy, Oh I say it's tough, I have had enough, can you stop the cavalry?" Er, how does one now get rid of it?! "One antidote to getting rid of a tune that goes round and round in your head could be to immerse yourself in another tune." Sadly, due to John Lennon's death, the re-release of 'Imagine' went to #1 following his death, preventing 'Stop The Cavalry' from reaching top spot! Anything you'd like to say about that quirk of chart fate?! "I always preferred John to Paul in the Beatles; he was a bit heavier musically than Paul. He was also an Elvis Presley fanatic when growing up, and had some musical danger about him in that he was prepared more than most to traverse musical frontiers and experiment." "His death was one of the big deaths of the second half of the last century, along with Hendrix, Joplin, Presley, Brian Jones, President Kennedy and Dr. Martin Luther King, and it was just amazing to find myself next to Lennon high up in the charts." 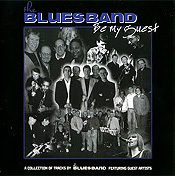 Your last public appearances, apart from a few radio and TV broadcasts, took place in the 1990s with solo public performances on a short UK tour as a special guest of The Blues Band. So, will the USA ever get to see Jona Lewie over here? There's the Here & Now, Rewind, and Regeneration tours, but we never get to see you named on the bill for the American side of things. Is there anything we can do to change this? "I would love to go to America again. I have been there twice. The first in August 1969, and I saw Nick Perles there who ran the Yazoo / Blue Goose record labels in Greenwich Village. I played a couple of numbers on the piano in his house and later that year he recorded me in London in the front room of my parent’s house where I played on my grandmother’s piano for an album that appeared on his record label." "The second time I was in New York was 10 years later in 1979 where I did a series of 5 nights, 2 performances a night at a club going strong then called “The Bottom Line”. It was a package of artists including myself that Stiff Records had flown over to New York from London to do the gigs. One of the acts in that package was the American Rachel Sweet who I think went on to host her own TV show in the U.S. in later years." "With regard to the gigs with the Blues Band in the 1990s, it was enjoyable and quite hectic as I did a series of over 50 gigs with them on their tour that had also included gigs with the Manfreds." "It would be great to do stuff in America again and if there is anything you can do to change the fact that I haven’t played there since 1979 I would be really keen to hear about it." Indeed, after all that early '80s fame-whirlwind wound down, it seems to me (from press now that relates to it back then) that you were kinda relieved - was that the case at the time? "One of the first things I did when I had a bit more time was upgrade my recording studio from an 8-track to a 48-track, quite a big upgrade and, in fact, at the time in around 1983-4, when it was completed, it was “state of the art”. I’d always liked studios and enjoyed recording processes, and never enjoyed too much the restraints of time that record companies would inevitably have to impose on their recording artists when it was getting close to going over budget." "You might say I’ve been pre-occupied in my studio on and off ever since, give or take the odd year." "Also, after the excitement of the early 80’s wound down, it was an opportunity to get some sleep, find myself, and play tennis. I had always liked tennis but had never joined a club which was finally put to mends when I joined my first club in 1988, a year after the record label I had been with for 10 years had gone bust." "It was like I found myself with a little bit of time to become a human being and I was even able to read the odd book or occasional newspaper again like when I was a student." When you look back at photos of yourself through the years, through the bands you played with, what's the first thing that comes to mind? "Looking back now from a bird’s eye view at the photos of being in bands through the years etc I recall always wanting to be in a band; and I remember also doing solo gigs particularly when I wasn’t in bands and thus appeared to go back and forth, back and forth, etc. - until actually ending up and staying a solo artist!" Are we to hope for a new Jona Lewie album this year, perhaps? And, as we're not called Exclusive Magazine for nothing, if there is, does it have a working title yet? "I was contracted to do a maximum of 5 albums for Stiff Records. I did two of them and in fact started on demos for my 3rd before Stiff went bust. And when Stiff was no longer around to provide pressure deadlines you didn’t worry so much if a track was being done at a different pace." "However the record business has changed massively and in fact seems to be dying on its feet as I speak. This is to do with technological changes. Right now I don’t know too much about it all– but the music industry is truly undergoing enormous change. I read some statistics in a music magazine the other day: for every 1 track sold as a paid download, 20 are exchanged “illegally”; and 70% of 15-25 year olds expect free music. Right now a fierce debate goes on about the why’s and wherefore’s, the pros and cons on the internet, stuff like freebies, bit-torrents, file-to-file sharing, commercial infringement of copyright, creative commons, ripping, etc. There’s controversial suggestions that file sharing software may be illegalised etc. and so on." "A lot of this is to do with how much less money there is now than there was in pre-internet days for writers and musicians etc when they’re involved in creating a popular piece of music." "The only thing I understand about it or tend to switch a computer on for is when I’m in the Studio because that’s part of my current setup." "I think my current album (which is actually only my 3rd one to date) will be released in spring 2011 (and hopefully the market for physical C.D.s’ won’t have entirely collapsed by then!). Of course it will also have an online presence and it will be nice to get it out." "There have been a few fun / working titles. We have one, and you’ll be the first to know in America." Please tell us more about the origins of a certain Terry Dactyl and The Dinosaurs ditty that made #2 in the UK Singles Chart in 1972! "One day I wandered into a junk shop near my college and saw an accordion that I bought on impulse." "From the age of 11, when I first saw a piece of rare footage on television of Big Bill Broonzy, I had always enjoyed early American roots music including black Cajun music which was played by accordion artists in Louisiana and, when I got it home I taught myself how to play it, which was quite easy really because I was already a piano and keyboard player." "I ended up writing a few songs on the accordion, one of which I decided I wanted to present to the band I was in at the time for their usage and felt great that they had accepted it, though a little disappointed that, when the record company decided to release it as a single, the band changed its name from Brett Marvin to Terry Dactyl. The track was called ‘’Seaside Shuffle’’ and didn’t do anything after its release by the small record company." "However, the track became a favourite at a particular club where a record scout happened to hear it and witnessed the great crowd reaction and wanted to have it on his own record company label, did a deal with the small record company and two weeks later it got into the charts after some brilliant marketing and promotion." "The track had languished for a year before it became very successful. And it’s one of those good luck stories that show how the balance between success and failure can often hang on just a thread." 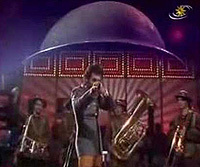 "It became a big hit, getting to number 2 in the U.K. charts in August 1972 and staying there for 3 weeks. It won a ‘Silver Disc” for having sold more than a quarter of a million copies. In addition a foreign version of the song went on to sell a million copies in Germany!" 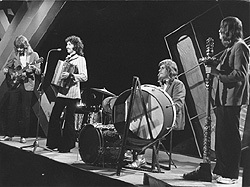 "Ironically all three separate original performances of “Seaside Shuffle” on the BBC TV’s flagship weekly chart programme “Top Of The Pops” got destroyed -- an inexperienced BBC tape operator had been erasing original performances from the master tape for some 8 months thinking he was doing the BBC a favour by saving on tape costs which were very expensive in those days. It is virtually certain that no known copy exists today. He was promptly fired when the BBC found out!" "However the follow up to the track in early 1973 was “On A Saturday Night” and a performance of it on a German TV music show survives." Is it true that one year you were an Ice cream Vendor at Wimbledon?! How did you get that job? "Yes I was an ice cream vendor at Wimbledon. Also, as a student, I sold Wimbledon programmes. I simply applied and got those jobs." "It was a great way to see the tennis. 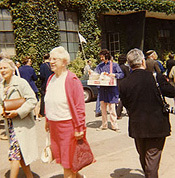 I’ve been to Wimbledon many times before and since but at that time the most memorable finals I saw by being an ice cream salesman were Laver and Roche in 1968, and Rosewall and Connors in 1974." "More recently I was lucky enough to see what everyone reckons is the best Wimbledon or any Grand Slam Final of all time: between Nadal and Federer in 2008 – and that was by having a ticket! --I was very lucky because probably the hardest ticket in the world to get is a Wimbledon ticket for the Men’s Singles Final!" If asked to record one for charity, what '80s (and possibly cheesy!) pop/rock song would you love to cover today...and why? "Maybe Human League’s 'Don’t You Want Me' or Dead or Alive’s 'You Spin Me (Right Round)'. But I think I’d prefer to do 'Blue Monday' by Fats Domino even though it’s a classic from the 50s." 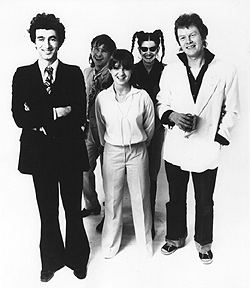 Fun Five - OK, it's now time to fire off some quick questions - to allow those that think they know Jona Lewie to perhaps think again! a) Do you remember your first TOTP performance for 'Stop The Cavalry'? Were you nervous all day or was it a breeze to record/tape live? "I tend to be more comfortable in front of an anonymous camera than real people at a live gig. Even if you’re doing it live, if it’s being recorded you have the ability to do it again if a huge mistake has been made." "However a live performance with a real audience has its own excitement and dynamic." b) Is there one of your songs that you look back on and would today change the title to, or a line/lyric from it - and if so, which one, and why?! "Once something's released I tend to leave it alone. The only one I can think of is in the track “Heart Skips Beat ‘ from my 2nd Stiff album where if I were to do the track again I would change the last line of the last verse from “We feel fine “ to “We feel great”." "To answer the question why: the change is closer to the intended meaning of the lyric." c) Do you have a recurring nightmare or dream - and if so, how does it usually end? "Fallng down, falling down, falling down and end up waking up. It happened when I was a kid occasionally." d) What is your sweetest, guiltiest pleasure (food wise!) late at night? "Banana on tomato on rasher of bacon on melted cheese on toast at 4 am when I used to go to bed late." Lastly, and throwing you a journalistic curve ball, Exclusive Magazine loves Penguins (the flightless bird, not the chocolate bar!) ... do you? "I enjoy watching penguins walk." "Have you seen the footage where penguins at the height of their arctic winter huddle and bundle together and then, slowly, each in turn rotate from being on the very outside of the bundle, where they are exposed to the icy winds, to gradually getting to the very centre of the bundle where they are protected from the cold by all the other close proximity penguin bodies; and the penguins continue with this rota until early Spring. How’s that for intelligent adaptation!" 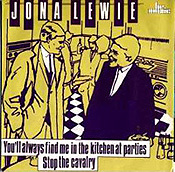 So, if you would like to win a SIGNED copy of a Jona Lewie Hits CD, and you think you know all there is to know about the man himself, just answer this easy question: The 1980 song and Lewie’s first hit record 'You'll Always Find Me in the Kitchen at Parties' was written for Stiff Records by Jona Lewie (melody) and Keef Trouble (lyrics). But, when Lewie added a new story-line ending to Trouble’s lyrics, he wrote the melody on which instrument (exact name) in his 8-track studio? !